Did you know that Cinco de Mayo means “fifth of May” in Spanish? 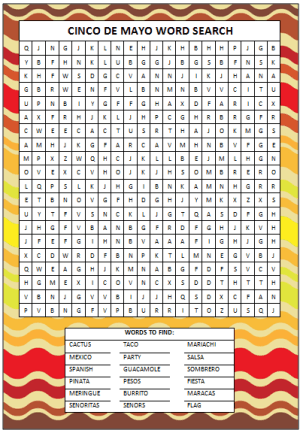 This free printable Cinco de Mayo Word Search is a fun activity for your kids leading up to this day of celebration. These searchable words may also lead to some discussions on what the Cinco de Mayo holiday is all about – a great way to sneak in a bit of learning! Click here for the free printable. The searchable words are listed on the free printable game. How many of these words can you find? What other words come to mind when you think of Cinco de Mayo? Let us know in the comments below. How does your family celebrate Cinco de Mayo? Do you host a large festive meal? If so, here are some delicious recipe ideas. Do you plan fun activities as a family? Here are some fun Cinco de Mayo activities you may want to try. Are Cinco de Mayo celebrations part of your heritage or are you looking to introduce your child to other cultures and traditions? Cinco de Mayo is always filled with such brightly colored decorations and delicious food so it’s no wonder why everyone wants to be a part of this party! For more fun ideas for the holidays including party ideas, free printable games, activity ideas and more – visit our special Holiday Fun page. We have all of the popular holidays listed along with some of the little-known (yet super fun to celebrate!) holidays categorized by month. Did you know that Moms & Munchkins is loaded with free printable games to enjoy with your family? Visit our Printable Games page for a listing of all of the games. We have scavenger hunts, word searches, BINGO, and our most popular category – charades! Never miss a family fun updated by following along on Facebook, Twitter, Pinterest and Bloglovin’.